A state law grants immunity from personal injury liability to anyone who opens their property without charge to the public for recreational use. The NBC Boston Investigators are looking at injuries sustained at City Hall Plaza, and the laws that prevent the city from paying out damages. A woman walking on Boston City Hall plaza tripped on a dip in the bricks last year. She said in a complaint to the city that she bruised her hands and knees and got a black eye. The city rejected her complaint, citing a state law that grants immunity from personal injury liability from “ordinary negligence” to anyone who opens their property without charge to the public for recreational use. Another woman, who needed a relative to translate for her to fill out the complaint form, fell over a broken brick around Christmastime in 2015. She reported injuries to her jaw, lips and knee, along with a concussion. It was rejected for the same reason. The city of Boston relied on that defense on several claims of injury, including broken bones and head injuries. An NBC Boston review of municipal immunity from liability in Massachusetts and surrounding states found that, aside from Maine, the Bay State has the laws for immunity of municipalities in the region, including New York State, that are most restrictive for residents to sue for injuries caused by degraded public property. Other states allow municipalities and other public entities that own property to be sued for injury and negligence in most cases. New Hampshire, for instance, specifically holds public entities to the same standard of liability as the owners of private property. A public records request of the city revealed four claims of personal injury, sometimes serious, where the person alleged the injury was caused by falling on broken, uneven or missing bricks on City Hall Plaza between 2012 and 2017. The numbers are not enormous, but the city, when asked why it should be claiming immunity in injury complaints on its property, said in a brief statement that it does not comment on legal strategy. NBC Boston contacted several of the people who filed recent injury claims against the city. They declined interviews. In Maine, all governments in the state are immune from personal injury claims for damages. Massachusetts allows a narrow exemption from immunity. Municipalities and the state can be held liable if an employee can be named and found to be negligent within the scope of his or her job duties. But other avenues of immunity exist, including the so-called recreational use immunity statute. Other New England states and New York grant no immunity to municipalities for functions like owning and maintaining property, meaning people injured on public property can sue in court for damages, though most states cap the amount of damages that can be awarded. Sheff, a former president of the Massachusetts Bar Association, said he hoped the state ends personal injury immunity for public entities. “Instead of trying to prevent folks from exercising their right to recover in lawsuits, we ought to think more about keeping those premises safe,” he said. David Doddridge, a forensic construction expert with offices in Boston and New York, measured steps at City Hall Plaza and at South Station and Dewey Square for NBC Boston. The steps at South Station generally were within building code as far as consistency of step rises and whether the step treads are level. But some step rises were not uniform, off by a half inch or more. Inconsistent step rises, often caused by thaw-and-freeze cycles in New England, could make people to trip up or down the granite steps. “If you are coming up the stairs you could easily catch your foot on this and fall forward,” Doddridge said. The complaints people filed with the city did not include exact locations of bricks. Some included photos. 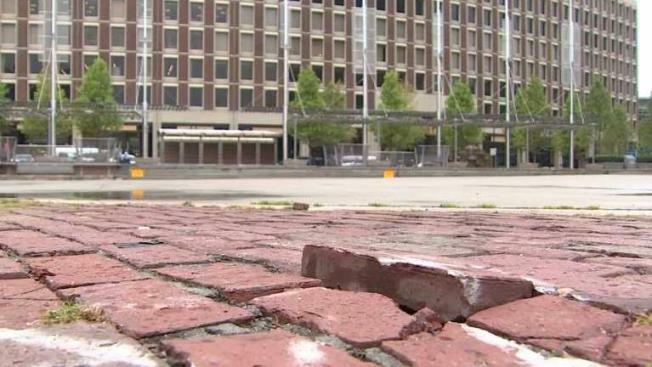 In one spot, captured in a photo taken of an expanse of brick between City Hall’s northwest corner and the John F. Kennedy Federal Building in late 2015, the condition of the bricks had deteriorated considerably between the time of the photo and when NBC Boston checked on the spot Sept. 6. The mayor’s office said it has a masonry contract, and spent roughly $111,000 on inspections and repair for the bricks last year. Its budget for brick inspection and repair is $112,000 this year. And the city is nearing completion on a new master plan for redesigning and reconstructing City Hall Plaza. That plan will include making the plaza more accessible and reducing the amount of brick. Remaining brick expanses would be replaced with new wire-cut bricks, similar to the bricks installed around the new Government Center MBTA stop on the plaza. Those bricks, according to the city, require less maintenance and are more secure.